AcryShield A500 is an excellent coating choice for both base and top coat over SPF roofing. It provides longevity and brightness with superior dirt pick-up resistance and protection against biological attack such as algae. AcryShield A500 contains ZERO VOC's and exceeds all ASTM D6083 requirements and also offers excellent tensile strength, elongation, and wet adhesion. AcryShield A510 can be applied as a base and top coat for SPF. It was developed for areas where additional fire retardant packages are not required. AcryShield A510 also exceeds all ASTM D6083 requirements and also offers excellent tensile strength, elongation, and wet adhesion. AcryShield A501 base coat is the industry leading, ZERO VOC, high performance base coat with optimum adhesion to SPF roofing. A501 provides an additional layer of waterproofing, superior adhesion, and resistance to ponded water. SRC 740 and SRC 750 silicone base and top coats deliver ultra low VOC coatings with high solids. 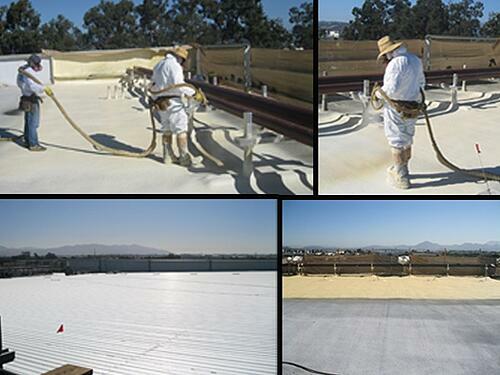 These coatings create a one-component, moisture-curing silicone roof coating system that can be applied in excess of 40 mils for SRC 740 and 70 mils for SRC 750 in a single coat while maintaining maximum adhesion without blistering due to the high solids content and absence of hydrocarbon solvents. AcryShield A550 can be both a base and top coat, it has double the toughness of any other AcryShield coating. With its urethane-like strength and elongation properties, this acrylic product is excellent for superior protection against foot traffic and physical abuse. AcryShield A550 also exceeds all ASTM D6083 requirements and also offers excellent tensile strength, elongation, and wet adhesion. AcryShield A590 base and top coat has ULTRA high reflectance with superior UV protection and low VOC's. It lowers air conditioning energy costs, reduces roof degradation, and prolongs the lifespan of the roof. A590 also exceeds all ASTM D6083 requirements and also offers excellent tensile strength, elongation, and wet adhesion. AcryShield Quick Set base and top coats are specifically formulated to resist early wash-off associated with heavy dew and light rain. Ask about our different quick set products for SPF. Base and Top coats: A600, A610. RoofGuard Granules are specifically designed for use with high performance AcryShield® roof coatings and are the superior choice for SPF roofing applications. These granules enhance the appearance of the SPF roofing system while delivering added durability, improving impact and foot traffic protection.